The gallbladder is a small pouch that sits just under the liver. 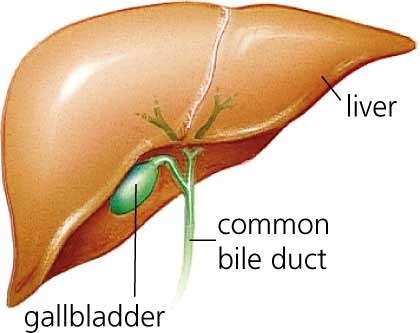 The gallbladder stores bile produced by the liver. After meals, the gallbladder is empty and flat, like a deflated balloon. Before a meal, the gallbladder may be full of bile and about the size of a small pear. In response to signals, the Gallbladder squeezes stored bile into the small intestine through a series of tubes called ducts. Bile helps digest fats, but the gallbladder itself is not essential. 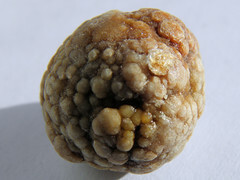 About 70% -80% individuals may not even know about suffering from gall stones. There are silent gall stones which pass on without detection. Removal of the gallbladder is not associated with any impairment of digestion in most people. 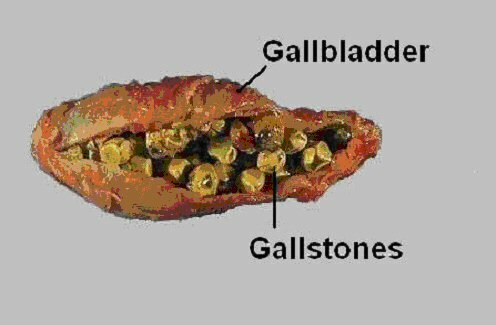 Gallstones (Cholelithiasis): For unclear reasons, substances in bile can crystallize in the gallbladder, forming gallstones. Common and usually harmless, gallstones can sometimes cause pain, nausea, or inflammation. Cholecystitis: Inflammation of the gallbladder, often due to a gallstone in the gallbladder. Cholecystitis causes severe pain and fever, and can require surgery when inflammation continues or recurs. Gallbladder Cancer: Although rare, cancer can affect the gallbladder. It is difficult to diagnose and usually found at late stages when symptoms appear. Symptoms may resemble those of gallstones. Gallstone Pancreatitis: An impacted gallstone blocks the ducts that drain the pancreas. Inflammation of the pancreas results, a serious condition. Gallbladder problems are usually caused by the presence of gallstones: small hard masses consisting primarily of cholesterol and bile salts that form in the gallbladder or in the bile duct. It is uncertain why some people form Gallstones. There is no known means to prevent Gallstones. These stones may block the flow of bile out of the gallbladder, causing it to swell and resulting in sharp abdominal pain, vomiting, indigestion and, occasionally, fever. If the Gallstone blocks the common bile duct, jaundice (a yellowing of the skin) can occur. Ethnicity. Because gallstones are related to diet, particularly fat intake, the incidence of gallstones varies widely among nations and regions. Genetics. Having a family member or close relative with gallstones may increase the risk. Up to one-third of cases of painful gallstones may be related to genetic factors. Diabetes. People with diabetes are at higher risk for gallstones and have a higher-than-average risk for acalculous gallbladder disease (without stones). Obesity. Being overweight is a significant risk factor for gallstones. In such cases, the liver over-produces cholesterol, which is delivered into the bile and causes it to become supersaturated. Weight Cycling. Rapid weight loss or cycling (dieting and then putting weight back on) further increases cholesterol production in the liver, which results in super saturation and an increased risk for gallstones. Metabolic Syndrome. Metabolic syndrome is a cluster of conditions that includes obesity (especially belly fat), low HDL (good) cholesterol, high triglycerides, high blood pressure, and high blood sugar. Research suggests that metabolic syndrome is a risk factor for gallstones. Risk Factors of Gallbladder Disease in Men. About 20% of men have gallstones by the time they reach age 75. Because most cases do not have symptoms, however, the rates may be underestimated in elderly men. One study of nursing home residents reported that 66% of the women and 51% of the men had gallstones. Men who have their gallbladder removed are more likely to have severe disease and surgical complications than women. Risk Factors of Gallbladder Disease in Women. Gallstones occur in nearly 25% of women by age 60 and as many as 50% by age 75. In most cases, they have no symptoms. In general, women are probably at increased risk because estrogen stimulates the liver to remove more cholesterol from blood and divert it into the bile. Pregnancy. Pregnancy increases the risk for gallstones, and pregnant women with stones are more likely to have symptoms than nonpregnant women. Surgery should be delayed until after delivery if possible. In fact, gallstones may disappear after delivery. If surgery is necessary, laparoscopy is the safest approach. Hormone Replacement Therapy. Several large studies have shown that the use of hormone replacement therapy (HRT) doubles or triples the risk for Gallstones, hospitalization for Gallbladder Disease, Or Gallbladder Surgery. The gall bladder disease can be life threatening, it must be treated as soon as it is discovered. Please tell me if gallstones can cause any infection if not treated on time?